Corned Beef FrittersGreat way to use leftover Corned Beef! Corned Beef Fritters are perfect for breakfasts, lunch and even a started at a dinner party! And if you an any vegetarian friends, you can make a veggie one for them! I always buy an extra large Corned Beef when I make it – just so that I can have fritters for the next day’s dinner (and kids school lunches!). Serve on their own and a bit of tomato sauce! To a large bowl add the corned beef, corn kernels, veggies, grated cheese and eggs and mix well. Add enough flour so that the mixture becomes gooey but stays together. Season well. Shallow fry the fritters on both sides until golden. Serve with tomato sauce and a salad if you want to be healthy! 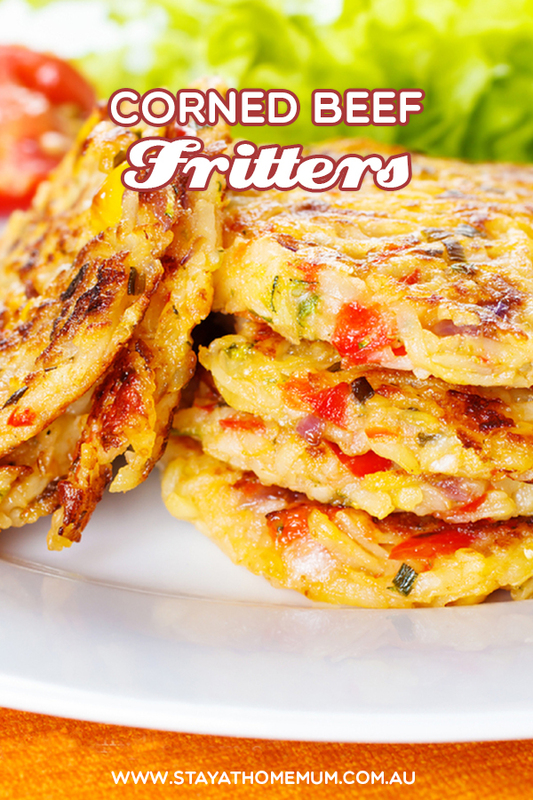 Everyone loves fritters, they are perfect for breakfast, lunch, dinner and even snacks; give this recipe a go. You won't regret it! Corned Beef Fritters can be frozen. Cool to room temperature and layer between sheets of baking paper and seal in an air tight container. Can be frozen for up to three months. Want a meat free version? - We have a Vegetable Fritter recipe too!